The P&G SimCenter, established 2014 and located at ZISC, aims to initiate, coordinate, and administer projects between P&G and FAU research groups especially in the area of modelling and simulation. It is based on the Master Collaboration Agreement between the partners, signed 2013. FAU and P&G have already been collaborating successfully for several years, working on improving the material properties of everyday products. For example, their researchers are using molecular models to gain a detailed understanding of hair structures in order to help develop high-quality hair-care products, and investigating the flow fields around rotating toothbrush heads more closely. Nappies are another area being researched. Simulations by a working group led by Prof. Dr. Michael Stingl, Professor of Mathematical Optimisation, and Prof. Dr. Marc Avila, Professor of Simulation of Nano and Micro Flows, have made a significant contribution to making nappies much more absorbent by determining the optimal arrangement for the superabsorbent materials. This research project and the new project are great examples of P&G’s sustainability strategy, which covers the careful use of resources, the use of renewable raw materials, and the use of waste products as raw materials. FAU is one of P&G’s largest academic research partners in Germany and has received around 1.6 million euros in funding to March 2015 as part of the strategic collaboration. Both parties benefit from working together, as the company can drive its process of innovation forward with ideas from external partners, while the researchers have an opportunity to work on problems with direct practical relevance. The partnership is very successful thanks to the technology transfer programme run by FAU’s Cluster of Excellence ‘Engineering of Advanced Materials’ (EAM) and the interdisciplinary network of experts that it has at its disposal. Furthermore, P&G is committed to supporting young researchers, which led it to establish the P&G SimCenter at FAU’s Centre for Scientific Computing (ZiSC) in May 2014. In addition to centres in Cincinnati and Singapore, it is only the third simulation centre of its kind in the world. At the centre up to ten Master’s students at a time work on modelling and simulation for current P&G projects. The aim is to use creative ideas to find new solutions for problems in image and motion analysis, manufacturing processes, and the optimisation of mechanical processes. ‘For P&G Germany, P&G’s second largest research location after the USA, it is especially important to get in contact with talented young researchers and to support them,’ says Dr. Katharina Marquardt, head of scientific communication at Procter & Gamble Germany, ‘The SimCenter is a fantastic example of this.’ After the first highly successful year, both parties are keen to extend the project. Signing of the Master Collaboration Agreement by Prof. Dr. Karl-Dieter Grüske, President of FAU and Dr. Helen Neville, European Vice President for Research and Development, Procter & Gamble. Back row from left to right: Prof. Dr. Wolfgang Peukert, FAU/EAM, Dr. Matthias Konrad, Bayern Innovativ, Dr. Klaus Hilbig, Procter & Gamble, Katja Hessel, Bavarian State Secretary for Economic Affairs, Prof. Dr. Tim Clark FAU/EAM. In a strategic cooperation with the global consumer products giant Procter & Gamble (P&G), EAM researchers will take a closer look at the materials in everyday products with a view to optimizing them. A large amount of developmental know-how is behind ubiquitous products such as nappies, toothbrushes and shampoos. Indeed, their fabrication is often as refined as for high-tech products. To obtain further improvements, cutting-edge techniques from modern materials science must be employed. EAM has already shown that through collaboration between mathematicians, scientists and engineers, the computer-assisted design of optimized nanoparticles, electronic devices, catalysts and lightweight materials can be achieved. Now, in the collaboration with P&G, which was initiated by theoretical chemists Prof. Tim Clark and Prof. Dirk Zahn, an interdisciplinary team of scientists will apply the techniques developed in Erlangen to help improve everyday products. For example, molecular models will be used to improve our understanding of the structure of hair and thus feed into the design of hair care products. In another area, the absorbency and durability of superabsorbent polymers, materials which can absorb many times their weight in fluids, will be simulated, assisting with the improvement of nappies and related products. Even the flow fields around rotating toothbrush heads raise fundamental questions and will be a subject of investigation by EAM researchers. The master collaboration agreement between the two partners guarantees a perfect basis for a long term strategic collaboration linking fundamental research and clear applications. 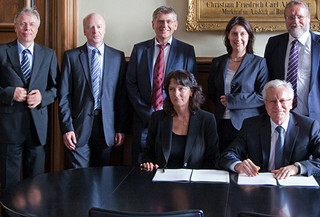 The signing on 30 July 2013 was carried out by FAU President Prof. Karl-Dieter Grüske and P&G, European Vice President for Research and Development Dr. Helen Neville. Bavarian State Secretary for Economic Affairs Katja Hessel, who also was in attendance, hailed the collaboration as clear evidence for the growing strong relationship between P&G and the State of Bavaria. Indeed for some time the state initiatives, Bayern Innovativ and Invest in Bavaria have been supporting the establishment of research and development collaborations with P&G.